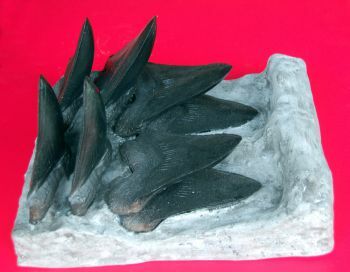 This replica Megalodon tooth progression shows 2 sets of 4 rows of 6 inch teeth. The teeth are cast from real teeth. The jaw section is our reconstruction of a jaw section because jaws are rarely preserved because they are cartilage that seldom fossilized. Megalodon had 46 front row teeth, 24 in the upper jaw and 22 in the lower jaw. Most sharks had at least six rows of teeth, so a Megalodon would have had about 276 teeth in its mouth at any given time. The teeth in the back rows were replacement teeth, sliding in to replace the front teeth when they become worn or damaged. Megalodon like all sharks replaced its teeth as it grew or the teeth become worn/damaged. New teeth are continually grown in a groove in the shark’s mouth and the skin acts as a “conveyor belt” to move the teeth forward into new positions. Younger sharks replace their teeth more often than older ones. Unfortunately, we have relatively little real data on the tooth replacement rates of modern day sharks, let alone a prehistoric one. But we can safely assume an adult Megalodon would have shed thousands of teeth in its lifetime. Megalodon meaning "big tooth" is an extinct species of shark that lived approximately 23 to 2.6 million years ago, during the Miocene to end of Pliocene Epochs. 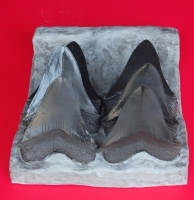 The largest verifiably measured Megalodon tooth known is nearly 7.5 inches. This monster tooth was found in Ocucaje, Peru. It measures 190mm or 7.48″ on the slant. It resides in a private collection in Peru. 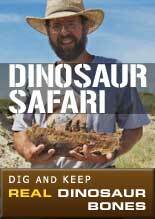 It was photographed, measured and casted by Craig Sundell, a researcher for the University of Kansas back in the 90’s. 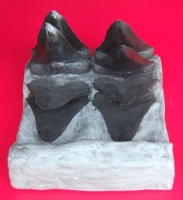 A replica of tooth is item 3010. Regarded as one of the largest and most powerful predators in vertebrate history Megalodon probably had a profound impact on the structure of marine communities. 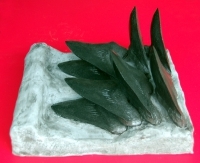 In the 1990s, marine biologists such as Patrick J. Schembri and Staphon Papson opined that Megalodon may have approached a maximum of around 24 to 25 meters (79 to 82 feet) in total length; however, Gottfried and colleagues asserted that Megalodon could have reached a maximum of 20.3 meters (67 feet) in total length. However, a commonly acknowledged maximum total length of Megalodon is 18 meters (59 feet). Gottfried and colleagues introduced a method to determine the mass of the great white after studying the length–mass relationship data of 175 specimens at various growth stages and extrapolated it to estimate Megalodon's mass. According to their model, a 15.9 meters (52 feet) long Megalodon would have a mass of about 53 tons, a 17 meters (56 feet) long Megalodon would have a mass of about 65 tons, and a 20.3 meters (67 feet) long Megalodon would have a mass of 114 tons.